The paperback Spanish edition of People of Darkness (1980). In its series "Bestseller Grijalbo Oro," the Spanish publishing house Grijalbo also put out Spanish editions of The Dark Wind (Vendaval de tinieblas) and Talking God (La conspiración de las máscaras). 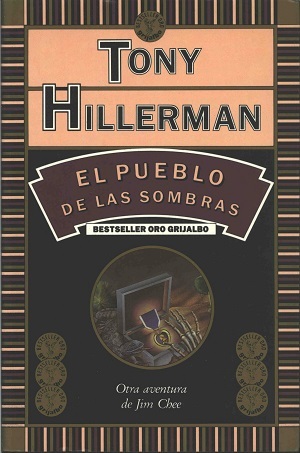 Tony Hillerman's original text was translated from English to Spanish by Maria Antonia Menini. The cover art was designed by Enric Satué and features a portion of the 1982 Avon cover for People of Darkness, inside a circle is the image of a skeletal hand reaching towards a lizard and Purple Heart medal within a box. The cover is also bounded by a pattern of pink, maroon, black and brown stripes.